2 WHY IS THIS A PROBLEM? 6 HOW WELL DO PATIENTS DO? Sarcoidosis is a multisystem, immune-mediated granulomatous disease of unknown cause that accounts for approximately 25% of interstitial lung diseases. The pathogenesis of sarcoidosis involves the CD4 Th cells interacting with unknown antigens, releasing inflammatory cytokines and causing the formation of noncaseating granulomas (figure below). This is most commonly seen in the lungs, however these granulations can be seen in multiple different organs. The granulomas that arise in the lung can ultimately cause restrictive lung disease, leading to shortness of breath and hypoventilation. Chief complaints: cough (chronic and dry), dyspnea, chest discomfort, bronchial hyperactivity, wheezing, hemoptysis. Nonspecific symptoms can include: fever, fatigue, malaise, weight loss. Erythema nodosum: common patient presentation are these tender bumps (nodules) that are under the skin. 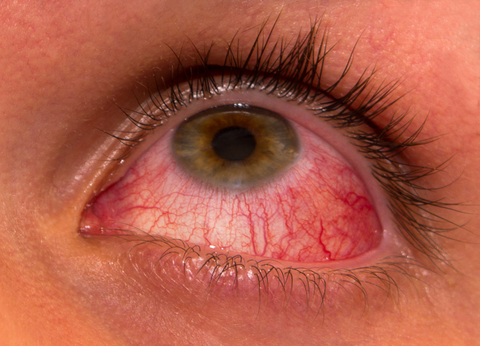 Anterior/posterior uveitis: a form of eye inflammation. It affects the middle layer of tissue in the eye wall (uvea). Sarcoidosis is a difficult disease to definitively diagnose, and is a diagnosis of exclusion (must rule out conditions such as idiopathic pulmonary fibrosis, pulmonary infection, vasculitis diseases, as well as others). With this in mind, there are classical findings that can be sued to help diagnose this condition (mainly a chest X-ray to visualize pulmonary disease, and a biopsy of the most accessible affected organ). 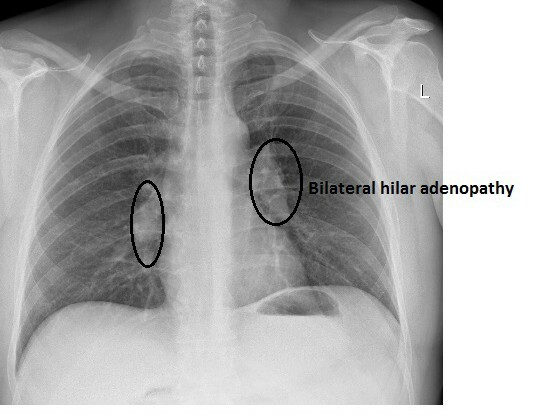 Radiological findings: bilateral hilar adenopathy on chest X-ray CT scan. The lymph nodes found in this region are often affected in sarcoidosis and this can be visualized by imaging. While not diagnostic the presence of elevated angiotensin converting enzyme (ACE) and hypercalcemia are common in sarcoidosis. Most patients are not disabled by the disease and treatment is not needed. Most interventions lack direct supporting evidence however oral steroids might improve chest x-ray findings. Lung transplant should be considered for patients with end stage disease. HOW WELL DO PATIENTS DO? Prognosis is very variable. Less than 5% mortality and remission occurs in about 66% of patients at 10 years post diagnosis (source) Recurrence is possible and can occur in any organ. Exact etiology not fully understood, so preventions is unclear. Hypercalcemia: Activated macrophages in sarcoidosis and other granulomatous diseases produce excess 1,25-dihydroxyvitamin D, which can cause hypercaicemia by increasing intestinal absorption of calcium and phosphate. 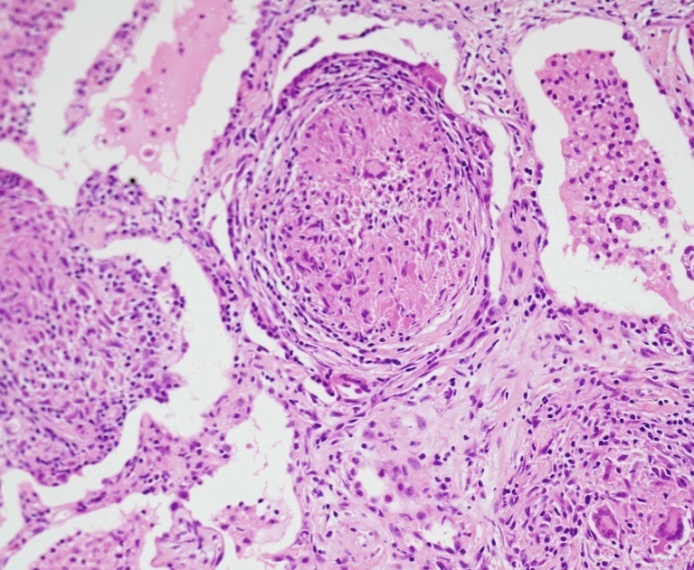 Other organ/tissue involvement: widespread granulomatous disease is common with sarcoidosis and can include many other tissues/organs other than the lungs. Also associated with restrictive lung disease (interstitial fibrosis), lupus prone, Bell palsy, and epitheloid granulomas.